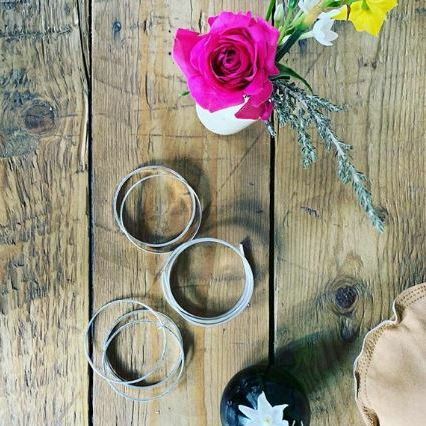 Spend an evening with Victoria Delaney at Quarterworkshop making a silver ring, that you can totally personalise with patterns and textures that Victoria'll teach you. This class is very beginner-friendly but the end result will have you looking like a seasoned pro. The JQ Set is a new workshop on Spencer St that holds classes and courses for beginners and improvers. If, like moi, you'd fall firmly into the beginners category, expect to learn a range of essential jewellery-making techniques to set you on the path for greatness. Using silver wire, a few tools, some guidance from Victoria and a helluva lot of cups of tea and biscuits, learn to make either one wide bangle or two fine bangles that are held together with a jump ring, in just a few hours. You're so clever. Earrings, pendant and keyrings, oh my! Jeweller Grace Page is your teach for the day at the Museum of the Jewellery Quarter's workshop. Materials are all supplied and you take home a pair of silvery earring gorgeousness. What's not to love? When: The earrings workshop is March 23 and they do other classes.